Welcome to a modern treatment of a classic two-berth caravan layout. 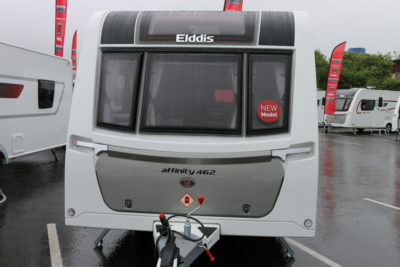 The 462 is the only strictly two-berth in the 2018 Affinity range from Elddis, whereas its three sister models can all accommodate up to four – with Elddis successfully walking the weight/equipment tightrope for each. Will the 122kg payload be sufficient? Bear in mind this is only a two-berth caravan. But, if needed the chassis rating can be upgraded to 1,350kg, for no extra cost. No doubt one of the star attractions is also one of the heaviest single items of kit. It’s the Alde “wet” central heating system, which comes with 24-hour programmability and an intuitive LCD control panel. 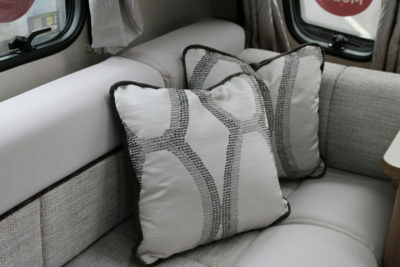 It’s certainly going to have no problems keeping this cosy in a ‘van this size. Daylight will stream in thanks to the usual three front windows arrangement, supplemented by a sunroof, plus Heki Stargazer rooflight running the length of the lounge, plus two further rooflights – standard size – towards the back. Even the lounge side windows seem that bit bigger than the norm. 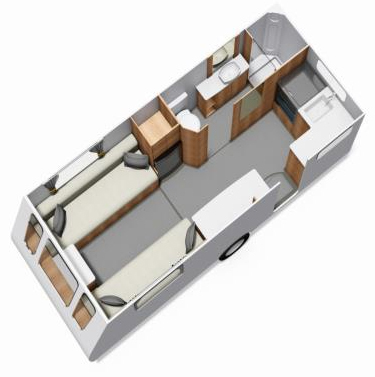 Light-coloured upholstery helps, too, in this respect, complementing a medium-brown finish for the furniture and two-tone treatment for the overhead lockers. The settees convert to a transverse double bed. 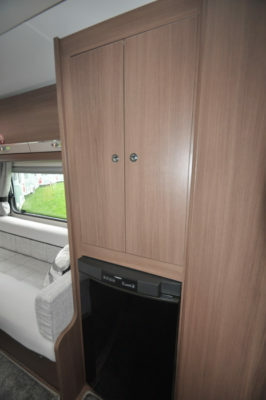 In day mode, there’s the usual chest of drawers/floor locker unit, plus slide-out table section, while you also get a mains socket and two USBs. 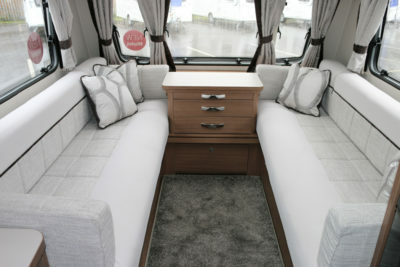 There’s two-way access to the settee base storage, plus there’s an external hatch to the nearside. The offside is home to the boiler electrics, various pipework etc. Aft of the lounge, the low-level sideboard unit adds to the feeling of space. It’s all set up to be your entertainment centre, too – there are two each of 230V mains and USB sockets, a single 12V outlet, plus various TV connections. 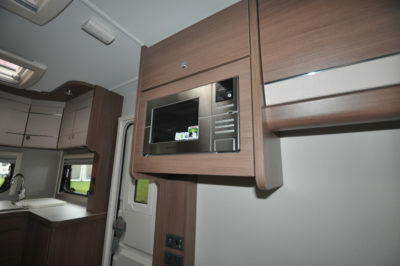 Elsewhere, Elddis have been just as generous with the provision of mains sockets. It’s all set up to take a solar panel, too. At the very back, the kitchen’s L-shape helps to optimise storage and worktop space. The second window here helps add to the feeling of space. 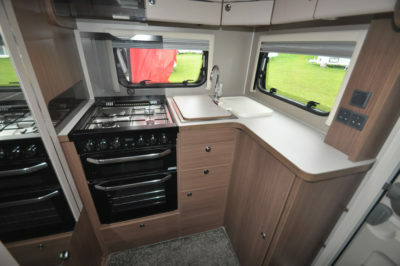 There’s a Thetford Aspire 2 cooker alongside a rather large sink – great for making the washing up etc all the easier, but it will take a lot of water to fill it up. It has a loose cover and an add-on plastic drainer. The drinks locker directly over the hob will surely gain the approval of some cooks. The kitchen’s influence extends to the microwave oven over the sideboard and a Dometic 8-series, 110-litre fridge with removable freezer box, under the wardrobe, where the free-standing table also stows. 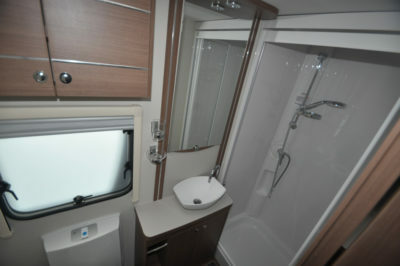 The offside rear corner washroom makes the most of its space with a shower cubicle, countertop basin in off-white, heated towel rail window and more. Noteworthy details include the Ecocamel Orbit showerhead on a riser bar, mirror over the handbasin, soap tray, toothbrush mug, rooflight and high- and low-level storage. 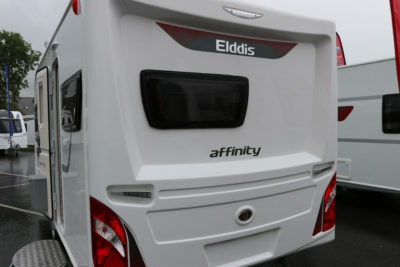 Like All Elddis products, the Affinity is made using its SoLiD construction, which relies on bonding rather than using screws and includes a GRP skin to the underside. Something else you won’t notice, but will be grateful for, is the stone chip-resistant front, including the locker panel. 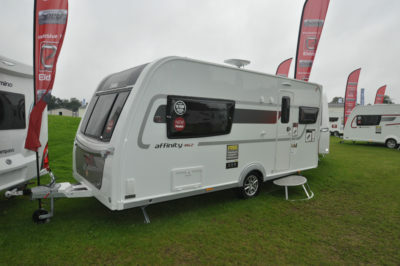 Those alloy wheels are exclusive to Elddis, too. Plus, all Affinity models are now on an Al-Ko chassis (earlier editions used BPW). Somewhat ironically, then, a minor criticism – and it’s certainly not reserved for just this model or indeed manufacturer – is some flexing of the furniture – e.g. the ledge over the front windows and the washroom door frame. Maybe it’s a price to pay for the savings in weight? 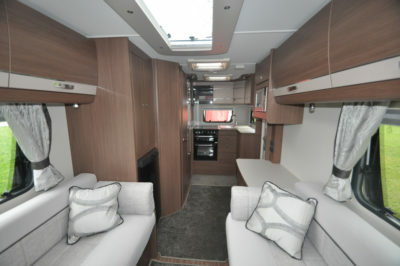 *Caravan insurance cost based on Elddis Affinity 462 caravan retailing at £20,894 fitted with hitchlock, AL-KO secure wheel lock, and alarm. Kept on drive at HX4 0BE behind locked gate post. 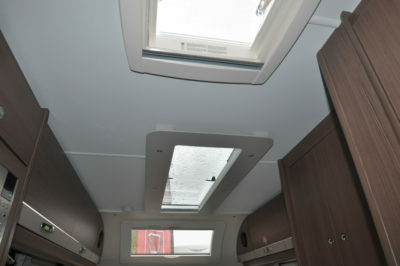 Caravanners over 30 years old, claim free for three years and a member of a caravanning club. £100 excess. 180 days European cover and up to £75 per day for up to 15 days emergency accommodation cover included. Legal expenses cover, extended European cover and other emergency accommodation expenses cover options are available at extra cost. Quote includes 10% online discount and 12% Insurance Premium Tax and is correct as of 14.11.17.